RCSI SURGICAL TRAINING OFFICE at RCSI-UCD MALAYSIA CAMPUS - rcsi-star's JimdoPage! Located within the premises of RCSI-UCD Malaysia Campus, the RCSI Surgical Training Office oversees the conduct, organization and implementation of various RCSI examinations, courses and research. 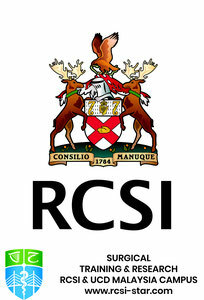 RUMC is a Foreign University Branch Campus of two of the oldest and most respected medical schools in Ireland, the Royal College of Surgeons in Ireland (RCSI) and University College Dublin (UCD). RUMC students undertake their pre-clinical studies at either RCSI or UCD, where they gain a comprehensive understanding of the biomedical sciences necessary to enter clinical training. Upon successful completion of their pre-clinical studies, students return to pursue their clinical training in Penang. During their period of clinical training in Penang, the students remain registered as full-time students of either RCSI or UCD.